← How Do You Know When to Pick Dry Beans & Peas? Here’s the whole garden picture from this morning. I feel like we are in a “maximum garden growth” stage with not much visible change at this point. Well…until you get closer, that is. There are a couple small berries on the ‘Ozark Beauty’ plants. They both had a couple of small bug bites, so I picked them off and sampled the other side of the fruit. My opinion? They were soft, which is understandable given the rain, but still too soft. It is usually considered “okay” for a fruit grown in a home garden to be softer, but I think these would have been mush by the time you picked a bowl full and took them inside. Assuming you could get a bowl full. They are small, which is also annoying. What would make up for these factors? Great flavor. Well…in this case the flavor was okay, but mostly just sweet with no depth. 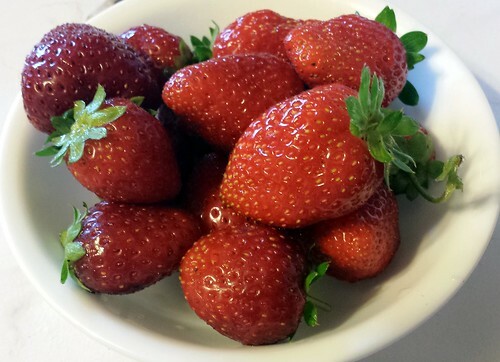 Again, partially explained by the rain, but still… This is a variety that you can find at lots of box stores in the spring and is touted as one of the best “everbearing” strawberries for home gardeners. Okay, because I can, I’m going to compare these to another variety (not in the Demo Garden) just to show the difference. These strawberries are a variety called ‘Albion,’ which is one of the day neutrals we considered planting in this garden. Instead we chose ‘San Andreas’ which was supposed to be better than this variety. Unfortunately, it didn’t make it, we suspect due to residual herbicide issues. I have been getting a solid handful of berries from my plants (and a friend with the same plants has too). 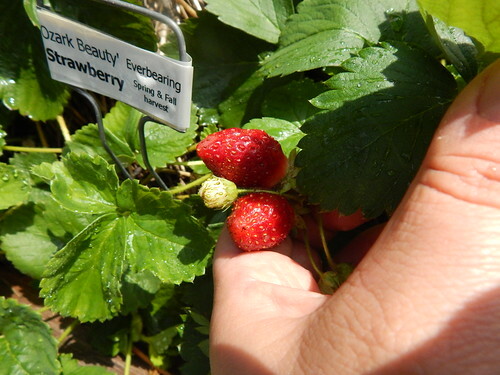 The berries are consistently medium to large sized, firm but not too firm, and have GREAT flavor. This is a variety that is a commercial variety for market growers. Maybe I’m missing something, but why wouldn’t this variety be better in your home garden too? Why as a home gardener should you be given the “best” choice of something that is clearly sub-par rather than a great variety like this one? 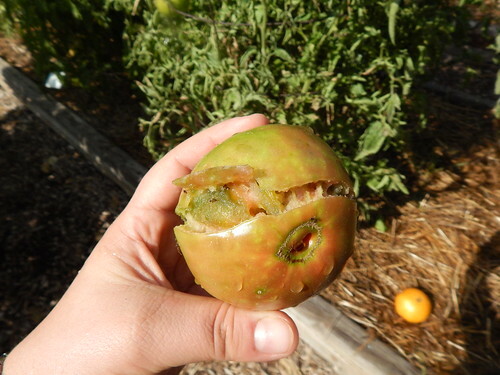 This is yet another case in point of why it is a good idea to pick your heirloom tomatoes early, when they just start to turn, rather than wait until they are fully ripe. This horrendous crack is due entirely to the rain we got. Do you see it? 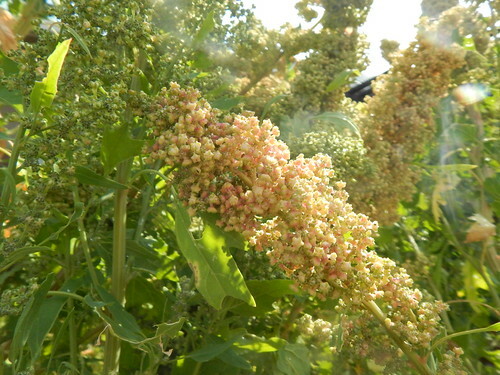 Do you see the tinge of pink showing up on this head of quinoa? Am I way to excited/anxious about this quinoa getting to the colorful stage? Yes, probably just a bit. If you think I may be more excited about the colors than actually harvesting the quinoa, you may be right. 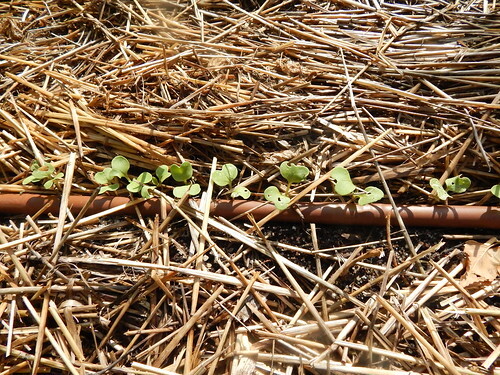 We have some radish seedlings! These are the Watermelon Radishes which seem to get planted at least every other year in the garden. These are in the MG Faves garden, so we will be looking for some colorful radishes later this fall. 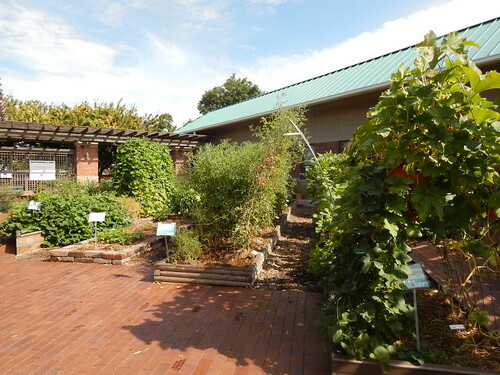 Posted on August 8, 2014, in PhotoEssays and tagged fruit, quinoa, radishes, rain, strawberries, Tomatoes. Bookmark the permalink. Leave a comment.